The latest Global Property report shows just five countries that have experienced a better property market in Q1 of 2009. So who are the lucky 5 and why? Switzerland, Austria, Germany, Canada, Portugal. Property Prices in rose by Austria by just over 3% for the year to the end of the first quarter of this year. 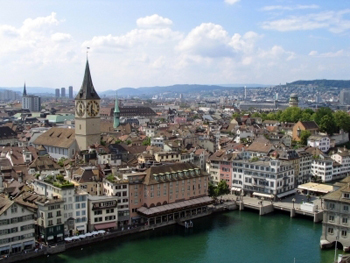 Many say that the Austrian Financial system is similar to that of Switzerland i.e. nice and health – well in better condition in comparison to other counties. Property Prices in Germany actually fell by 1.28 per cent in the 12months to the end of quarter one. So why does it appear in the top 5 doing well in the property market crisis? Property prices in Germany remain practically stagnant throughout 2008 – Not only that but clever, well planned Germany do not have the problem of huge amounts of unsold and unfinished properties on the market – like some other countries have! Again property prices in Portugal have fallen but only by about 5% for the past two years. How did they avoid massive property price drops? Well hard to believe but while we were all madly building properties for an imaginary influx of mass population grow Portugal somehow managed to missed out on the crazy price boom from 95 to 06 – Lucky them! So while prices may have moved a little there, Portugal remains quite stable. Last but not least and moving across the pond, at number 5 is Canada. Again property prices have dropped there, approx 2.86% but have barely moved from this. It is also said that because taxes are high in Canada are therefore act as a deterrent to potential foreign investors. Ideal homes Portugal the expert Agent, villas, town house, apartments for sale in the Algarve. We assist buyers in their quest to Buy property in Portugal. It is known by real estate experts that Turkey is in the position of attracting investors for the long term. In addtion, if we take into consideration the potential membership into the EU, a long term process, then foreign investors should consider utilizing these advantages to its fullest extent. While Turkey is draw on Spain as a model; consequently applying this model and the time period for accession into the EU, these few fundamental factors may just be noteworthy enough to guide investors into realizing that there are tremendously worthwhile real estate investment returns to be gained in Turkey.